Thank you, Miss Rabbage – For the fainthearted . . . There was a moment filled with regret this evening. I did look for Miss Rabbage in the past, maybe ten years ago or more. Perhaps I was just too late, perhaps if I had been more diligent, perhaps if I had just asked more people, I might have found her. Not finding her in the telephone directory, I assumed she had died long before. This evening, in the village cemetery, I found her memorial stone at the plot where ashes are interred. 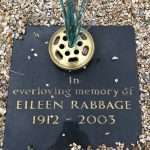 Miss Rabbage had only died in 2003, a year before this blog began. 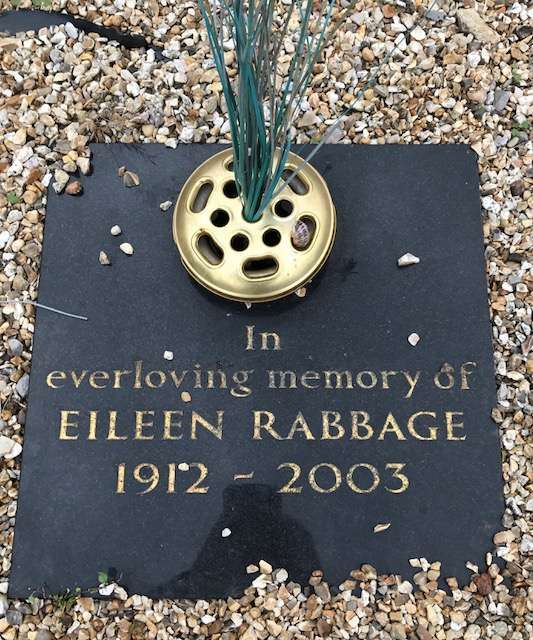 The desire to see Miss Rabbage was born of nothing more than a wish simply to say “thank you,” to acknowledge the formative role she and her colleague MIss Everitt had played. It is forty-five years since I left High Ham Church of England Voluntary Controlled Primary School where Miss Rabbage and Miss Everitt comprised the entirety of the full time staff. Miss Everitt, was there from 1947 and taught for thirty years until her retirement in 1977. 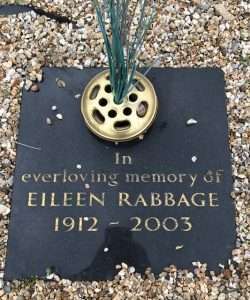 Miss Rabbage retired in 1972, at the age of 60; had she been a teacher there during the war years? They were questions that an eleven year old would never have thought to ask for fear of a slap for being cheeky. Teaching at the school was never exciting, but it was solid and it was lasting. The daily recitation of the times tables in the infant class created a capacity that has never declined – anything up to 12 x 12 and my response is instant and automatic. We were expected to answer without needing to think. Spelling was based on textbooks called “Word Perfect”. There were sixteen words set from the book each Monday and a test each Friday morning. Sixteen correct out of sixteen earned a gold star; fifteen out of sixteen and the star was silver; much below twelve, and Miss Rabbage was not pleased. Miss Everitt taught her own infant class and taught “nature” to Miss Rabbage’s junior class’ – we would have to sketch sepals and petals and stamens and label them neatly. Miss Rabbage taught us ancient history – there were charts on the wall telling of Sumerian civilisation; and taught us modern history – we once had to draw slips of paper with the names of people in Victorian times about whom we were to write a project, I drew Disraeli, but being unsure of who he was, swapped with someone who had drawn Shaftesbury, they got a much more exciting subject! There was pressure to work hard and to do well. Never having the tidiest handwriting (I reverted to printing when I was fifteen because my joined up writing was so bad), I dreaded the handwriting classes where we were given inkpens and books from which we were to copy copperplate script. There were moments of respite: programmes to watch on the school television; BBC Schools broadcasts on the radio, particularly “Singing Together”; our attempts to play recorder, (‘Every Good Boy Deserves Food’ might have meant something to someone who could hear the difference between the notes E and D); art classes taught by Mr Shield, who came one afternoon a week and who had been in an RAF bomber during the war and whose passion in life was his pigeons. Of course, if asked, there would not have been a day when I could have told anyone what I had learned, but we learned, and we learned, and we learned. Rabbage is a name I’d not come across before. But there seemed to be lots like her in those country two room schools on both these islands. Which, of course, is of little surprise since the Primary School Act 1870 was one of the few applied equally on both islands without let or hindrance tolerated by earl bishop or viscount. But then it also paid out to all if the student was poor enough, church schools too. One of the reasons we’ve such a problem with schooling in Ireland. But where it carried forward kids education it utterly obliterated three languages, Welsh, Irish and Scottish. Of course France did something like it and it almost erased Breton, and did many of the sub languages of French, Orc is all but gone. Remaining only in accents on Isle de France “sal d’bang” salle de bain. Oddly enough, I think the quest for elementary teachers is a bit of a ‘thing’, or at least occurred twice. For last year I was driving from Cashel to Clonmel for something or other and tootled about the cemetery in Rosegreen where The Master is buried.